The NFL Draft is in the books, summer is here, and fantasy football drafts are just around the corner. It's never too early to start thinking about sleepers, and no position in fantasy football is more important than running back. Let's take a look at five early 2018 sleepers! Remember this guy? It seems many fantasy owners have forgotten him. 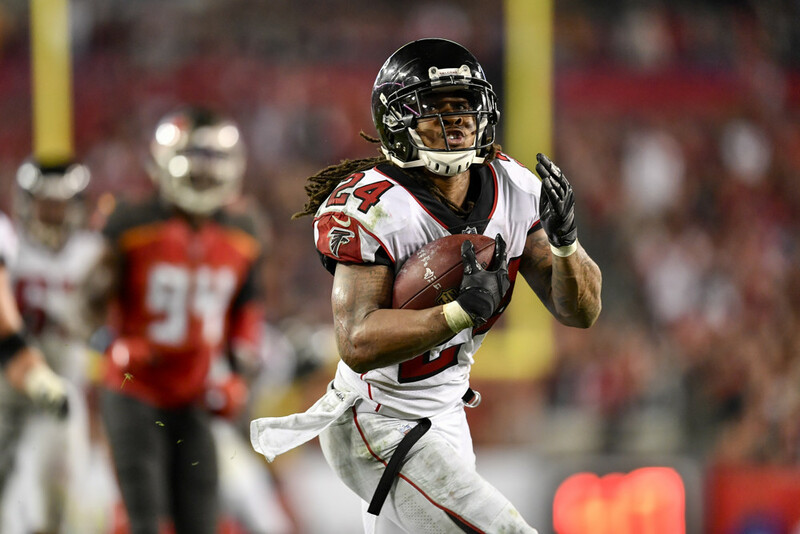 Devonta Freeman has finished as an RB1 three straight years in a high-powered Atlanta offense and has established himself as a safe lead option with upside, but he's available late in the second. So maybe Freeman is a little boring. You want the hot new option. You want to look smarter than everyone else. But you don't need to be a hero. Atlanta's offense took a huge downswing last year and still allowed Freeman to finish 12th, and now he's being drafted as an RB2. Atlanta has improved their line and added Calvin Ridley in the first round, and Freeman is a safe option with plenty of upside. He's a great option in the late second round. McCaffrey was becoming one of fantasy's hottest sleepers until Carolina signed C.J. Anderson, but that should keep his draft price in check. Anderson will get onto the field on third downs as a much better pass blocker, but that might not mean McCaffrey is off of it anyway, as he can move to the slot and keep catching a lot of passes. Norv Turner is here, and historically that has meant huge numbers for bell cow running backs. McCaffrey looks like a guy that could be this year's Todd Gurley. Fantasy football is about opportunity over talent, especially at running back where runners are a dime a dozen. Miller has disappointed a lot of owners expecting big things the last couple years, but he was a top-18 fantasy option in Houston each year with over 1000 combined yards and six touchdowns each season. Miller's price tag is down right now because of a fear of D'Onta Foreman, but Foreman is recovering from a torn Achilles, an injury that often takes a long time to recover fully from, if ever. Houston will see running lanes and plenty of points with a healthy Deshaun Watson, and Miller looks like a bargain with huge opportunity. Mack was a favorite sleeper for 2018 as last season came to a close, but most fantasy analysts assumed Indianapolis would bring in some running back help. They did draft Nyheim Hines, but he's more of a pass-catching weapon, and Mack looks like the guy with the opportunity. If Andrew Luck comes back healthy this season, that will almost certainly turn some Colts runner into a possible 1000-yard rusher with plenty of TD opportunities. Mack is poised to take advantage, and he was explosive in limited opportunities last year. It's hard to believe the value on this one, and Penny will surely see his price rise by the fall, but grab him on the upswing while you can. Penny is a small school rookie, but he's one Seattle believed in enough to take him in the first round, and he'll have every opportunity to take the lead role with injury-prone Chris Carson and C.J. Prosise the only guys in his way. Take a look at the price tag of other rookies: 2nd round and rising for Saquon Barkley, 6th for Derrius Guice, and 7th for Sony Michel. Penny is a steal at this value even if he's just another Seattle plodder, and if he's actually good, he might be a draft winner.